Bunco originated in the 1800's as a parlor game. Over the years, the game has been passed down from friend to friend, and its fame has spread across the nation. Fast forward to the 2000's, where this popular progressive dice game reemerges as Box of Bunco. Now Bunco games can be played by as few as two players or in groups as large as 12. There are six rounds of play, each with a different target number (one through six). Roll three-of-a-kind of that target number (a Bunco) and score big. 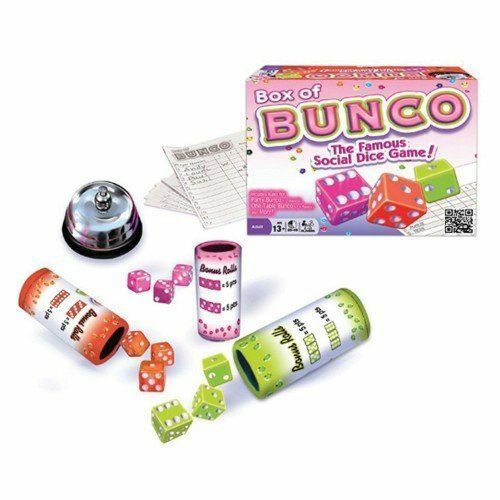 Box of Bunco brings you light competition and wonderful social fun, making it a great game for kids, families, couples and especially parties. Includes: silver-tone bell, nine dice (three different colored sets), 3 dice cups with special, optional “Bonus Roll” rules printed on each cup, 2 sided score pad, storage tray, and instructions.